David Murray "Dave" Brockie (August 30, 1963 – March 23, 2014), better known by his stage name Oderus Urungus, was a Canadian and American musician. He was best known as the lead vocalist, bassist and guitarist for the American multi-genre band Gwar. He performed under such genres as thrash metal, punk rock, shock rock, heavy metal and comedy rock. He was born in Ottawa, Ontario, Canada. Brockie was found dead by a bandmate on March 23, 2014 in Richmond, Virginia, aged 50. The cause was an accidental heroin overdose. He was given a traditional Viking funeral in a public memorial before the 5th annual GWAR-B-Q event. ↑ Baldwin, Brent (March 24, 2014). "Gwar Frontman Dave Brockie Has Died". Style Weekly. Retrieved March 24, 2014. ↑ Moskovitch, Greg (March 24, 2014). "Report: Gwar Frontman Dave Brockie Found Dead". Music Feeds. The Feeds Network. Retrieved March 24, 2014. ↑ "Gwar frontman Dave Brockie died of heroin overdose". BBC. June 4, 2014. Retrieved June 28, 2014. ↑ "Dave Brockie sent off in style at pre-GWAR-B-Q memorial service". Metal Insider. August 16, 2014. Retrieved October 31, 2014. 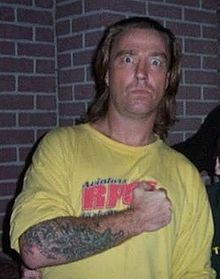 Wikimedia Commons has media related to Dave Brockie. This page was last changed on 4 March 2015, at 17:48.